Place cream cheese in resealable food-storage plastic bag. Cut 1/2 inch off 1 corner. Pipe about 1 tablespoon into each celery piece. Cut ham slices lengthwise into 16 pieces. Cut pieces crosswise into 1 inch pieces. Place about 12 ham pieces over cream cheese to look like "bandages;" use tip of knife to tuck in ends of ham along celery edge. Cut cranberries into 40 pieces. Place pieces between "bandages" for mummies’ eyes. Cut a thin slice from bottom of celery so it lays flat. 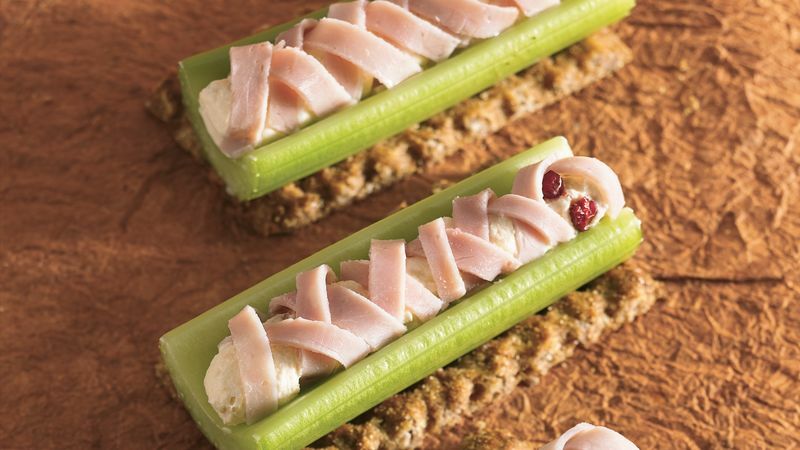 Serve these yummy mummies on whole-grain crackers.